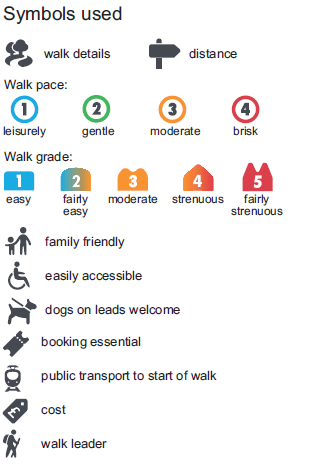 Over 50 walks are listed by date in the online and PDF programme, using icons to explain their key features. Full details of each walk, and booking details, are listed on each walk detail page. Booking and tickets: All walks (apart from a couple which are stated clearly as drop in) require advance online booking, which is provided by The Little Box Office, and payment taken where required. Booking is very simple and quick, and you are able to add more than one walk to your basket in order to add your details only once. Please list the walkers’ names and details of a contact in case of emergency on the day (ie, next of kin) when prompted. Your ticket will be emailed to you which you should print off (or carry on your mobile phone) and bring with you to the walk. Ticket pricing: Most walks are free (but still require booking), although in some cases walks are chargeable, with ticket prices reflect the nature of the walk, event or activity. For walks which require payment, some are taken online, some are payable on the day. Dogs: Some walks are suitable for dogs on short leads. If you wish to bring your dog, please check that your chosen walk is one of them. Suitability: There are events for all ages, abilities and fitness levels. Please read the full details including the pace and grade to ensure suitability for you / your family, and that you wear suitable clothing and footwear for your comfort, the walk and weather conditions. Walk cancellations and changes: Walks will take place in all weathers apart from exceptional circumstances. We will endeavour to contact you by email or phone if a walk is cancelled. Meeting arrangements: Please see the walk details page for detailed meeting arrangements for each walk, and ensure you are there in good time. Emergency contact: Check the Duty Officer Rota Oct 18 for details of who to contact in an emergency in advance of your walk, or on the day. Questions or queries: Please contact walkingfestival@chilternsaonb.org or, during the festival, contact someone from the Duty Rota above. Please contact Anna Foster if you have any questions or queries about the festival.